Internet Explorer has been the whipping boy of the internet for some time now, particularly Internet Explorer 6. Now it seems Internet Explorer 7 may be the new cool target. This is necessary due to the amount of time our web team has to waste to ensure our site appears correctly in IE7. The claims made in the blog post and the statement are just not true. I’m not calling them outright lies, but they are at least misrepresentation. This is not a tax. It is a surcharge, as Kogan says in its blog post. However, in the message to end users it refers to it as a tax four times and even uses a “stamp” to imply it’s a tax notice. A savvy user should get it, but this tongue-in-cheek attempt to look official is in contrast to the statement on the blog. This can be a problem from an accessibility perspective when you consider users with cognitive disabilities. The blog post claims the “tax” is assessed based on how many months IE7 has been around. This month it is 6.8%, next month it will 6.9%, in August it will be 7%, and so on. There is nothing to indicate that to users. 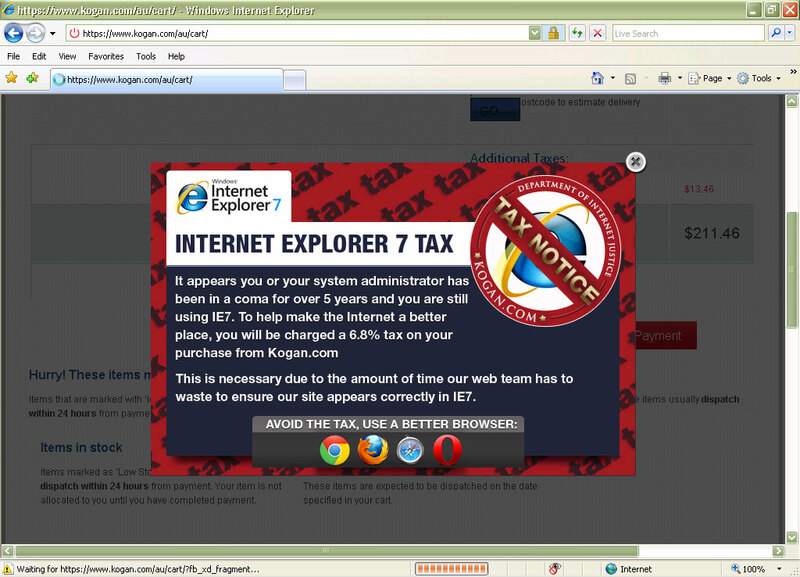 There is no “tax” for Internet Explorer version 6. If there was a tax for IE6 using the same calculation as for IE7, then the rate would be 13% (as of this month). A simple argument is that the site is not intended to work well in IE6, and if that’s the case then there is no reason to not also display a message to IE6 users saying as much. Again, Kogan claims it spends time making the site look normal on IE7, but not only doesn’t define normal, it doesn’t acknowledge that it doesn’t need to look the same. Kogan’s decision to spend time and effort trying to replicate the exact same experience for IE7 is what is costing users, not users’ inability to upgrade their browsers. Kogan does not state in its blog post how many users of IE7 come to the site. It may very well be only 3 users a year. If that’s true, it makes this even more of a gimmick and likely would not have had the splash Kogan wanted. If far more, then Kogan can justify its position by providing an outline of how it will track the success of its campaign — short of proving that IE7 users who cannot upgrade won’t be back. Kogan doesn’t tell users in its message to upgrade to a more recent version of Internet Explorer, it tells users to use a better browser and lists Chrome, Firefox, Safari and Opera. It doesn’t even list Internet Explorer 8 or 9. I don’t much care about rudeness. When I see language like this that talks down to me I typically decide the copywriter/management is/are an idiot and that’s it. Not all users will feel that way, particularly users who cannot upgrade their browser. Having witnessed what happens when either non-savvy users or users who are trapped on a platform are told they aren’t good enough, I am confident this message will only offend those on IE7. It’s just a technical form of bullying. That it draws hoots of support from those who only care about the new shiny only bolsters my point. Kogan claims on its blog that “we all have a responsibility to make the Internet a better place. By taking these measures, we are doing our bit.” Given that the site doesn’t even support IE7 nor does it help users with useful language, I am suspect. If Kogan’s claim is true, then Kogan should donate the “tax” money (it clearly isn’t using) to support organizations who cannot upgrade for financial reasons, perhaps starting with not-for-profits in its hometown. There are users who are trapped in work environments that will not allow an upgrade. There are users who are not technically savvy and don’t know how. There are users who cannot afford a new computer with a newer OS. There are users who can only access the web from libraries or internet cafes. There are users who stay on a browser version because it works with their add-ons (such as accessibility software). Kogan is a private business (I assume based on the site) and may choose which customers to support. It doesn’t need to even try to support IE7 (I argue it doesn’t anyway). However, its gimmick will be taken up by web developers who only see arguments to support their own bad behaviors and who may very well work for organizations where supporting all users (poor, disabled, technically clueless, trapped) is necessary. If a web developer cannot come up with valid reasons on his or her own for why someone may not be able to upgrade, then I argue that person is a terrible web developer.